On September 14th 2007 Steve Lukather was invited for a Van Halen rehearsal. Here's Luke's reaction to Bob Lefsetz after the show. On June 8th Toto played the Canyon Club in Agoura Hills, California, with special guest Joseph Williams. Reggie Boyle was there and made a cool report. In April 2007 Luke's friend Steve Weingart played the Baked Potato with his band Nu Alliance. Reggie Boyle made a cool report. On February 9th and 10th 2007 Steve Lukather played the Super Live Revisited concert with Mathieson, Laborial Jr. and Sklar. Reggie Boyle was there on February 9th and wrote a cool review for the fans, completed with some nice pictures. On the day Luke played the first two sets at the Spud, Reggie Boyle again was Luke's guest in the studio, where Luke & his friends are recording Luke's new solo album. It was another music filled weekend at the National Association of Music Merchants (NAMM) in Anahiem, Ca. On Saturday January 20th I had the chance to spend a few moments with Steve Lukather and some of his cohorts at the NAMM Show. While hanging out at the Ernie Ball Music Man booth Luke talked to me about the new record, Ever Changing Times. I was lucky enough to be invited into the recording studio by Steve Lukather for the recording of his new solo CD. I felt even luckier when Luke told me "you're the only person besides Trevor who hasn't worked on the CD that's heard these songs. Wait he has played on it so you're the ONLY outsider to hear it!" This took place at the Steakhouse in North Hollywood, Ca. Lukather: "New news... On February 9th and 10th 2007 a reunion of sorts will occur at The Baked Potato as I am re-uniting with Greg Mathieson to perform a bunch of old material from the classic Baked Potato Super Live record we did in 1981. Filling in for Jeff Porcaro and Pops (Robert Popwell) are Lee Sklar on bass and Abe Laborial jr on drums. Should be a blast and a walk down memory lane. Its been a LONG LONG time since I jammed with Greg and 20 some odd years since we played any of these tunes! It will be great to play while I am doing my solo record to keep the chops up." Abel Sanchez, the writer of the extra-ordinary book Van Halen 101, visited the Toto show in Fort Pierce, FL, USA on November 10th. He wrote a cool personal report especially for Stevelukather.com. Reggie Boyle - Benefit for Cliff at the HOB, L.A. There was barely enough room to hold all the notes that were being played at the "Benefit for Cliff" at the House of Blues in Hollywood, CA, on Saturday September 30th 2006. 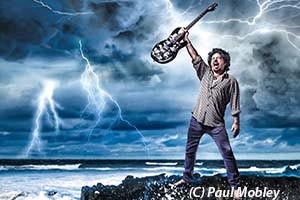 From September 2006 till June 2007 Steve Lukather worked on his 5th solo album Ever Changing Times. The album was released in Europe in February 2008 and got a VERY good response from the fans and the press. The world wide ECT tour started in June 2008. Lukather: "I am playing a benefit with Joe Satriani and Steve Vai on September 30th at the House o Blues Los Angeles, CA. I am workin on that as I gotta keep my chops up to play with those guys. They are VERY dear friends and monster players. Perhaps I should try to win "slowest guitar player on the gig award"?? What do you think? Hahaha... Cause THOSE cats have the scary chops. Love it myself. They are also VERY musical with it. I think Paul Gilbert and Scott Henderson are doing it as well with no doubt more guests added daily. I am just gonna do a tune with Joe and some jamming at the end with everyone. It's for an old friend that is very ill. Life..."
The Last Miles is the first book to focus exclusively on the final decade of Miles’s life and music, a period that has all too often been dismissed by critics and fans of Miles’s earlier musical periods. It contains interviews with almost 100 people including, band members, session musicians, producers, engineers, management and road crew. Here's the interview that George Cole did with Steve Lukather. On September 6th Joe Walsh played with his old James Gang buddies at the Gibson Amphitheatre in Los Angeles. Reggie Boyle was there to have fun and make a report for Stevelukather.com! Steve Lukather spoke to author Walter Kolosky early last year for his book about the legendary Mahavishnu Orchestra. The book, entitled Power, Passion and Beauty, The story of the Legendary Mahavishnu Orchestra, The greatest band that ever was, has just been published and features quotes from Lukather alongside in-depth interviews with John McLaughlin, Jan Hammer, Jerry Goodman, Rick Laird and Billy Cobham and many others. Anyone who knows Toto only for its cadre of pop hits in the '80s ("Rosanna," "Africa," et al.) simply knows little about this enduring dream team. Toto's appearance on ZDF show Wetten Dass!? Toto's appearance on the German ZDF show Wetten Dass!? on April 1st was extremely successful and was watched by over 13.4 million viewers. The appearance featured the band play a medley of their old hits Rosanna and Africa together with the brand new radio hit single Bottom Of Your Soul. The band will also appear in the TV show Hitgiganten on SAT 1 on May 31. On February 7th 2006 Lukather attented the Les Paul & Friends: 90th Birthday Salute. Star drummer Kenny Aronoff contributed to Luke's rhythm section along with Matt Bissonette on bass. Reggie Boyle was there to make a review and had a cool chat with Kenny on working together with Steve Lukather. The National Association of Music Merchants (NAMM) Show is the top music gathering of the year. It is the annual Music Convention held in Anaheim,CA, USA. It was missing a little something this year as Steve Lukather was absent due to prior commitments. But Steve's son Trevor was there to pick up a little of the slack. There were numerous other music people there so I took the oppurtunity to get a few words from them about Steve.